Pregnant and worried about your cat coping? Here are 13 tracks of baby & toy sounds to prepare a cat for the arrival of a human baby. Designed by a behavior veterinarian, it is the most comprehensive range sounds available to best prepare your cat. Do you have a much-loved pet? Your 'fur kid'? Are you expecting or trying for a baby? Does your pet know? Do you want to learn how to prepare your pet for the new addition? Has your pet heard a baby cry, scream or laugh before? These sounds are specifically digitally remastered for the sensitive hearing of dogs, cats, rabbits, birds, guinea pigs, chinchillas and all other common household pets. A baby makes many different noises and many pets become quite frightened by new high pitched and scary sounds. Your pet needs to be familiar with new sounds ranging from crying to giggling; sneezing to splashing in the bath; as well as all those noisy toys. Prepare your pet for these new sounds with these tracks and ensure that problems such as stress, hiding and not eating do not occur. Dr Lewis Kirkham, a veterinarian with further qualifications in animal behavior, has a lifelong fascination with pets and their interaction with their owners. Since graduating as a veterinarian from The University of Melbourne in Victoria, Australia, Dr Kirkham has worked in a variety of practices in both Australia and the United Kingdom. In 2004, he founded Animal Behaviour Solutions, a company that provides private counselling and behavioral advice for pet owners. Through this company, Dr Kirkham has assisted numerous pets and their owners in the assessment and management of behavior problems. He is also a consultant to local and international zoos and sanctuaries on exotic species’ behavioral problems. Dr Kirkham regularly features on radio and online media regarding behavioral problems in pets. He contributes to The Age, Herald Sun, The Daily Telegraph, The Courier Mail, The Advertiser and The Australian newspapers, Dogs Life, Living and Lifestyle and Urban Animal magazines. He has also been published in the Australian Veterinary Journal. He is a member of the Australian and New Zealand College of Veterinary Scientists as well as a chartered member of the Australia Veterinary Association. He is also a member of the American Veterinary Society of Animal Behavior. The birth of his two daughters ignited his passion for educating expectant parents about the smooth transition from a child-free, cat-owning family to a larger family with a new baby. Dr Kirkham’s work was initially published as 'What your pet can expect when you’re expecting (2005)', the first comprehensive resource for expectant families who own a dog or cat. 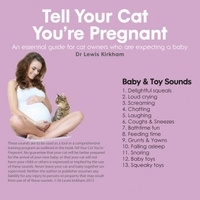 This was re-released in 2012 by Little Creatures Publishing Pty Ltd as 'Tell Your Dog You’re Pregnant: An essential guide for dog owners who are expecting a baby' and then his second book, 'Tell Your Cat You're Pregnant: An essential guide for cat owners who are expecting a baby' was released in 2014. Currently Dr Kirkham divides his time between his family, private veterinary practice, companion and exotic animal behavior referrals and online veterinary support.